The beginnings of Italian Neorealism can be found with the director, Roberto Rossellini. His movie, Rome, Open City. It is a movie about the collaboration of the Catholics and Communists fighting Nazi occupation of Rome shortly before the American army liberated the city. Some of the footage is reported to have actually been shot during the Nazi retreat out of the city. Parts of the film are conventional and some stereotyped. Rossellini wanted to convey the cruel atmosphere that existed during Nazi occupation, and many of the film's narrative elements are based on actual events during this time. Vittorio de Sica: If Rossellini brought neorealism to the forefront of world cinema, it was De Sica who sustained the movement. He collaborated with scriptwriter, Cesare Zavattini on all of his neorealist films. One of his greatest and most widely known films is The Bicycle Thief. In this film there is a Chaplinesque blend of pathos and comedy. The film is acted entirely by nonprofessionals and consists of simple events in the life of a laborer. The film is about the protagonist getting a job (at the time of the movie, 25% of the Italian workforce was jobless) and in order to get to work, the protagonist has to get his bicycle out of hock. In order to do that, the protagonist and his wife have to pawn their sheets and bedding (her wedding dowry.) On his first day at work, the bike is stolen. The rest of the movie deals with the attempts to recover the bike. It touches on Italy's institutions and cultures--the government bureaucracy, political parties, the Church, popular beliefs, neighborhoods, the family, soccer. It is a painful realization for the protagonist's son, Bruno, that his father is human and not the super hero that he considers. The Bicycle Thief stands alongside Rossellini's Rome, Open City as a neorealist achievement. It was, however, not without its own controversy. The film offered no slick solutions and so fell between the firing lines of the country's ideological debate--to conservatives it was impermissible to show society's flaws so brazenly, to the left, it lacked analysis and a clear agenda for social change. De Sica says to us though, "My films are a struggle against the absence of human solidarity. . .against the indifference of society towards suffering. They are a word in favor of the poor and unhappy." Italian Neorealism ended in 1948. Liberal and left wing parties wee defeated in the polls. Levels of income were surpassing prewar levels, most Italians liked American cinema and the vision of a desolate, poverty-stricken country outraged politicians anxious for democracy and prosperity. Italy's move from individual concern with Neorealism to the tragic failure of the human condition can be seen through Fredrico Fellini's films. Fellini: La Strada For Italian film, is a transitional movie. The larger social concerns of humanity, treated by neorealists, gave way to the treatment of individual needs and the tragic failure of the human condition and human communication. Here we see Fellini with a fairly strong sense of plot, although we might fail to understand the significance at times of the scenes as they seem to unfold in an order void of logic. 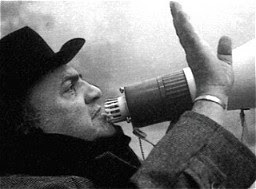 Fellini is a director concerned with moral and spiritual conditions of the human heart. His films are internal struggles that become abstract in their design in order to attempt to communicate that which is at time uncommunicatable. La Strada is a film that deals with a more broad issue, not as much internalized as his later films would become, but more on the surface, dealing with issues that are abstract, but still fall within relatively easy grasp. Where Italian neorealism aimed at psychological analysis and ultimate description of feelings, Fellini left the interior of his characters unrevealed. We never truly understand why Gelsomina would stay with Zampano. She claims, by the words of the "Fool" that everything has a purpose. She sees her purpose as staying with Zampano. The "Fool" or the "Clown," as some refer to the highwire walker, helps Gelsomina to begin to see the marvelous, to feel the "rapture of life" a quality which is not supernatural or gratuitous, but rather simply a quality of nature. This is something Zampano does not understand and so revolts against. We see the Clown and Gelsomina as having no real understanding of "being." They exist, but they do exist with a soul. Gelsomina learns from the "Fool" that she belongs to the world. She learns that she is something besides an outcast, and she learns that she is irreplaceable, that she has a destiny which is to stay with Zampano. When the "Fool" is murdered, in a sense, so to is Gelsomina. Or at least she is rendered helpless by the unnecessary act. Zampano becomes terrified by the girl's suffering and in the end loses his patience and abandons her. Zampano will eventually be crushed by his loss of Gelsomina's absence in his life. It is not through remorse, or even by love, but through the overwhelming and incomprehensible sorrow which can be the only sensation of his soul, deprived of Gelsomina. The connection begins with the "Fool" and is cemented into place with the visit to the convent. The nature of this spirituality is there to be seen and felt by both Zampano and Gelsomina, but only the girl understands it while Zampano only wants to steal the silver from outside the window of the granary where they will sleep for the night. The spirit is lost, the human tragedy is in the failure to see this loss (Zampano) until it is too late."